This comic was originally drawn in a 24 page 4" x 6" sketchbook. 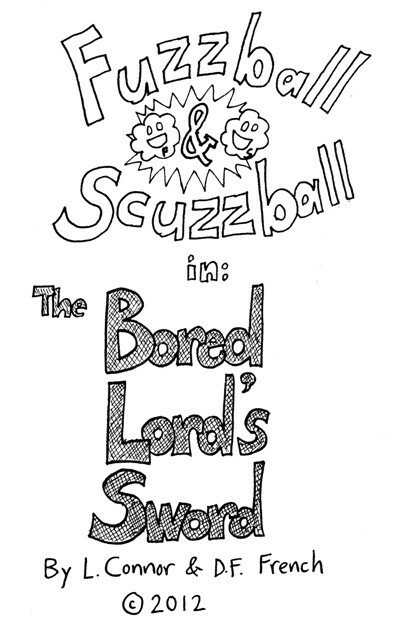 This title page was the last page drawn, since we didn't know what the story was going to be when we began. The gimmick is this: I drew the first story page (page 2, counting the title page), my friend DFF drew page 3, and we switched back and forth, with me drawing the odd numbered pages and him drawing the even numbered pages. We did this with no planning or discussion. Also, no pencils. How will this creative exercise turn out? Coherent story, or sloppy mess? Tune in and find out!